Texas bull nettle (Cnidoscolus texanus) is more than capable of defending itself from potential herbivores or an unwary naturalist. Bull nettle is a good plant species to know and respect! It has many uses and can be very beneficial, but it also packs a mean sting if you stumble upon it or fail to handle it properly. 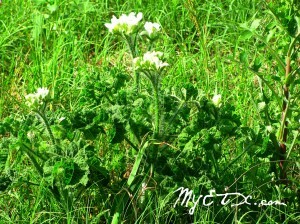 Most people who grew up in East Texas know to keep a sharp eye out for this plant. One sting from bull nettle is not something that will soon, if ever, be forgotten. Texas bull nettle is usually one to three feet high with several stems that enables the plant to thrive even in the hottest part of the summer. Leaves are alternate, tow to four inches, divided into five leaflets, crinkled in appearance and covered with stinging hairs. If any part of the stem is broken, a milky sap appears, and some people are allergic to this as well as the sting of the hairs. The flower consists of five to seven white, petal-like sepals, united below. 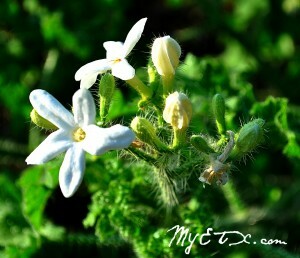 The white flowers are mostly harmless but the remainder of the plant is loaded with trouble. There is no doubt that this plant means business. If one brushes against the leaves, they will feel the mean sting for 30 to 45 minutes, and it could take several days for the area to fully heal. During summer months many people are affected by bull nettle stings. Nettle is not actually a weed, it is a herbaceous plant that actually has many medical uses. Nettle causes a histamine reaction that causes a burning and stinging sensation if it comes in contact with bare skin. The burning, stinging itch caused by an encounter with a Texas Bull Nettle is agonizing. Between the bull nettle’s green leaves and round flowers are tiny threads that contain histamine and other chemicals, including folic acid. These chemicals can cause mild to severe irritation of the skin. Symptoms include itching, burning and swelling. East Texans have been exploring ways to ease the pain of the stinging plant for years. While there are several theories for relief floating around, most folks will recommend urinating on it! Urine contains something that reacts chemically and soothes the pain instantly on contact. Urinating on yourself, or perhaps your buddy, might seem a bit unorthodox and disgusting, but when you wade off into a bull nettle, you’ll be ready to try just about anything. Others say tobacco and spit will also provide some relief from the sting. Those who have attempted to soothe a sting with tobacco recommend breaking a cigarette to free the tobacco, then spitting on it before placing it on the sting. Human saliva has a slightly basic quality, and in a pinch this may be your best chance for relief. A baking soda paste is believed to be the most effective neutralizer for the acidic sting of the bull nettle. Applied to the area of the rash immediately after contact, this paste works quickly to ease the pain and soothe the itching. Mix the baking soda and water to make a paste. Cover the area with paste. Leave the paste on the area for up to 30 minutes. Remove using warm water. Repeat three times a day or as needed to reduce itching and burning until the rash heals. If you are hiking or working outside in an area known to contain stinging nettle plants, it is a good idea to carry a small container of baking soda and a bottle of water. In the event that you are stung, you can mix up a paste as soon as you are stung. Alternatively, you can carry insect sting-relief pads, wipes or liquid. These are also effective in relieving the pain and itching associated with the sting of stinging nettle. If you do not have baking soda on hand, look around for curled dock or jewelweed. Often, these plants grow in proximity to stinging nettle. Either of these plants may be rubbed on the affected area to soothe the itching and burning of the sting. Once you return to an area where you can administer proper first aid to yourself, examine the affected area. If you see spines protruding from your skin, use the sticky side of a piece of duct tape or masking tape to remove them. Wash the area with soap and water, then pat the area dry. You may wish to apply an antihistamine cream to reduce swelling and redness. Stinging nettle has a long history of use as medicine. Extracts can be used to treat arthritis, anemia, hay fever, kidney problems, and pain. Fresh nettle is used in folk remedies to stop bleeding because of its high Vitamin K content. 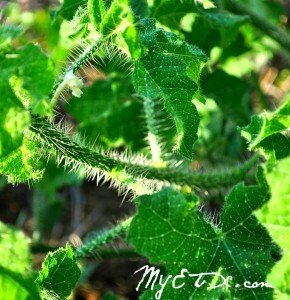 As you venture outdoors in East Texas keep your eyes peeled for bull nettle, or feel the mean sting of this native Texas plant. Do you have a home remedy for the mean sting of bull nettle? Email us your experience and remedy to myetx.team@gmail.com. 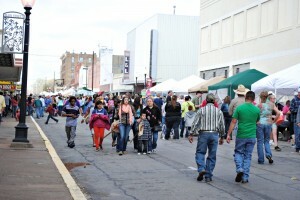 PALESTINE- The Palestine Area Chamber of Commerce kicked off the 75th Annual Dogwood Trails Celebration Saturday, in Historic Downtown and Old Town Palestine with near perfect weather conditions. If you missed out last weekend, don’t fret, as the festivities will continue for the next two weekends! Galveston, Texas- Take a musical journey across time and genre this August to beautiful Galveston Island with the Oldest Town In Texas Road Show. 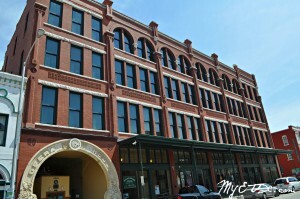 For one night only you can enjoy an outstanding night of family fun and music including a variety of showstoppers from past to present, featuring musicians from Nacogdoches at the Grand 1894 Opera House on August 16, at 7p.m. ATHENS-The Athens Farmer’s Market is a non profit organization that provides a local venue for fresh veggies, fruits, breads, & homemade crafted items. The market has been created & is run by Athens women with a passion for the community & a desire to keep the market alive! I once was touched by this nettle on my jeans leg and I went the rest of the day not knowing about it. After reaching home some hours later, I recognized a problem and it took a month for the effected area to heal completely. I have mowed them often and then after digging I find a tubor about 6-8″ below the surface that guarantees a return of the plant. If anyone knows of some simple herbicide that does not require a severe drenching of the plant of which ends up in the groundwater, i would like to hear about it because I am digging out the tubors as often as I find them and that seems to guarantee they are gone. I used triamcinolone acetone to take care of my bull nettle inflammation. It’s prescribed by the doctor and took care of redness, itching and general pain. It was gone in 3-4 days. Ammonia works well. I also scrape the area witht the bottle cap to help get the needles out. FromPops in Crow, Texas. The baking soda worked here this morning. Had box of ARm and hammer in the fridge and made cold paste. Applied twice and then put a sock on it. Pain and itching Almost completely gone in 45 minutes. Still some minor pain ; swelling still there big time though. Blisters. We used a Benadryl Gel first and that relieved some of the pain, then did the baking soda paste.!! That baking soda remedy DOES NOT WORK. I just got into a horrible sting with a bull nettle recently. The only thing that helped was rubbing my sting on the fingers with PrepH (yes the hemmorhoid cream) an placing my hand in a latex glove overnight. However, I think that any ointment would do as long as you cut off air to the sting. When I removed the glove the next day, it was as if the sting was fresh all over again. I quickly replaced the latex glove, and got some relief, but without it the night before I would not have been able to sleep at all without the glove. The only way this sting goes away is with time. In my case, THREE full days. I don’t have many of these around, but I will methodically seek them out and spray them with weed killer. Horrible experience. Again, the ONLY thing that worked for me was cutting off air to the sting. Wrap it with plastic wrap whereever it is, or suffer.